All your favorite healthy nuts in one single pack! Peanuts, cashew nuts, almonds, and macadamia - go nuts with these 100% natural crunchy nuts! 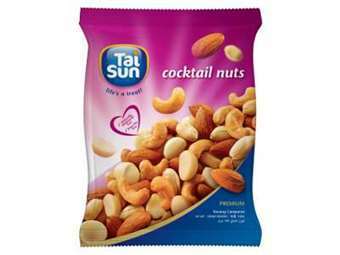 Packed with nutrients, minerals and natural fiber, Tai Sun Cocktail Nuts are nutritious and provide significant health benefits from each type of nuts included in the pack. They are high in fiber and a good source of protein, antioxidants, and heart-healthy fats. Also a good source of many important B complex, vitamin E, and minerals. Consistent reduction risk is said to be observed and this is associated by the intake of nuts in the daily diet. Reduced risk of heart disease with the nuts abundant heart-friendly fats - oleic and palmitoleic acids help reduce bad cholesterol levels and total levels as a whole while increasing good cholesterol levels in the blood. Almonds are rich in fiber, vitamin E and a great source of magnesium and manganese. These nutrients have vital roles in metabolic functions, muscle and bone health. Peanuts are rich in vitamin B3 that is good for metabolism, and manganese for essential nutrient absorption in the body. Macadamia nuts have polyphenol compounds, which help lower risk factors of coronary artery disease. Cashew nuts have anacardic acid that helps enhance sensitivity to insulin (good for diabetics) and helps in preventing chronic inflammation. A fistful of these little nuts per day can make a big reap of benefits without sacrificing your form. 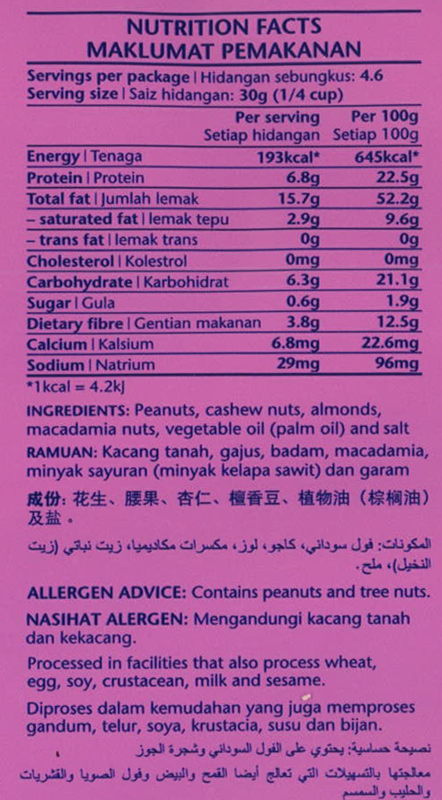 Peanuts, cashew nuts, almonds, macadamia nuts, vegetable oil (palm oil), and salt. *Contains peanuts and tree nuts. Keep in cool and dry place, away from direct sunlight.